Ukulele: I used to think I wanted to play the guitar, but soon discovered I didn't have the patience. 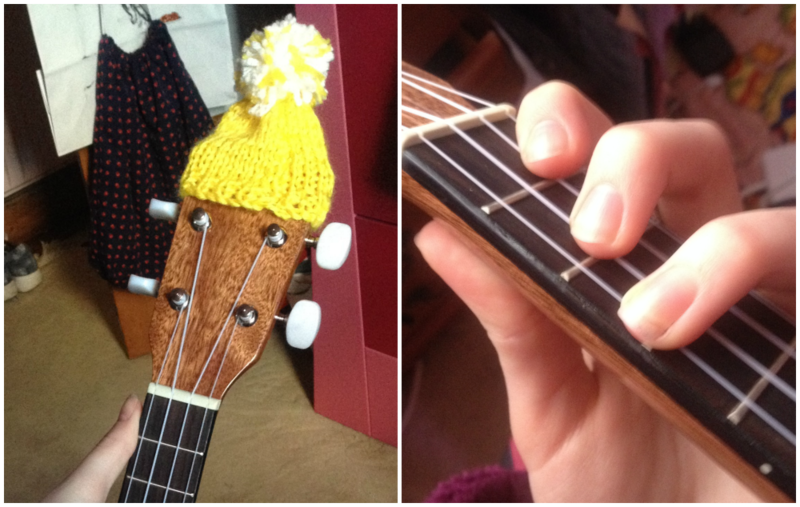 The ukulele however is much more fun and I've found it quite easy to pick up the basics. Also, how cute is its little hat? It's off an Innocent Smoothie and now I want them all. L'Oréal Paris Super Liner Perfect Slim Intense (£6.99): Felt tip eyeliners are definitely my favourite due to how easy they are to use and this one is just the right thickness and length for that perfect line. As I have small eyelids, this liner has been extremely helpful. L'Oréal Paris True Match Foundation (£9.99): Surprisingly, this is the first foundation that I have felt comfortable and confident wearing out as all the others have been far too dark and orange for my incredibly pale skin. I'm basically Olaf from Frozen. I use the shade Rose Ivory if there are any fellow snowmen out there. Gym: The quest for a bikini body by summer properly began in February as I paid for my membership at Napier gym. If you'd like to know my views on gymming, click here. Cadbury Dairy Milk Egg 'n' Spoon: I can't believe I have only tried these gems now but they are just an explosion of chocolatey loveliness in your mouth and I can't wait to buy more. I totally didn't eat three in one night though... definitely not. The Casual Vacancy TV Mini-Series: I confess I haven't read the book, but the adaptation of J.K. Rowling's novel was the first program in a while I have actually been interested in enough to sit down and watch without distractions. I have to say I am very glad I did although the ending did confuse me a little... it seemed like there were a lot of loose ends which I don't like. Years & Years: They did Take Shelter and massive hit Desire but my new favourite has to be King which you can watch here then report back on how much you loved it. I also adore their 2015<3 playlist on Spotify (click here to listen). The little things blog by Louise has had me addicted since I discovered it - the design is so pretty and her content so creative. If that wasn't enough, her photography is gorgeous and her writing is also pretty fab. T.G.I. Friday's: The first time I went to this restaurant I was about 7 and can only remember the crayons I used to colour in the kid's activity sheet so I was excited to try it again. Luckily the quesadilla surpassed my expectations and with free-refillable drinks and a dessert called Brownie Obsession you can't really complain, can you? Doesn't that look good? The dessert was possibly even better! How was your February and what were your favourites?